Here at The Royal Lodge Riverside Restaurant we welcome you all to dine in our restaurant or enjoy eating out in our mature gardens. We use carefully selected local produce and serve Cream Teas all day! Our Breakfast has won an AA Award for four consecutive years now. Depending upon your appetite, we have something to satisfy everyone. At lunch we serve everything from hearty meals to light lunches with sandwiches, baguettes and ploughmans also available. We are delighted to have won the AA Diner Award, using local ingredients wherever possible. We serve modern and classic British food and there are always daily specials available. We love our desserts! All of our desserts are handmade in our kitchen using quality ingredients and we regularly change our desserts depending upon the season and what is freshly available. Leave A40 (T) at South Herefordshire Motor Caravans in between Ross and Monmouth. 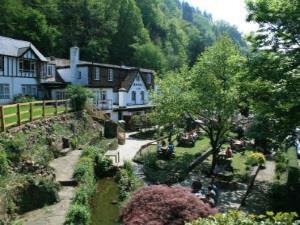 Travel along the B4229 and then follow signs for Symonds Yat East. Continue through the hamlet to the large car park at the end where you will find The Royal Lodge.